How do you show versus tell in writing fiction? Tears fell from Leydon’s face. Only joking. Show don’t tell, is more advanced than that. It’s about picking up on the little things in life, that get across to the reader someone’s current emotional state, and their attitude towards X.
Leydon walked to the ice cream van to buy ice cream, infiltrated with glare. I suppose that we all can describe the environment, without explicitly saying what it is, and that we all do it in writing. You’re not exactly going to write “The room was so tense, you could cut the tension with a knife” are you? Of course you don’t. These sorts of environment showing not telling, comes naturally. It comes natural to you, without having to think about it. But you know that it’s good to explicitly describe the weather most times, by saying the words sun, rain, wind or snow; and to rarely not do so, by saying there was a smell of freshly cut grass. Implicit description doesn’t work so well for stories, so don’t do it because you want to or because I’ve told to, but do it without thinking about it or because you need to. A great writer will be able to create depth by implying something. I cannot actually give you any examples without any context. I need something to let you read, where people’s emotions and intentions are implied, that you can understand without knowing the storyline, and it just so happens that I’ve written some chapters which would be suitable for this. I wouldn’t use show don’t tell, in such a basic manner. The best way to get better at writing, is to read more writing to experience it for yourself, so you can know what sort of things writers can do, before you start putting the techniques into practise. I would give you comprehension questions for the many things implied in my chapters, which makes its effect on the reader, but that wouldn’t help someone who knows nothing on the matter, how to learn at first. [ ] Ask questions or try to figure out how the effect was achieved. 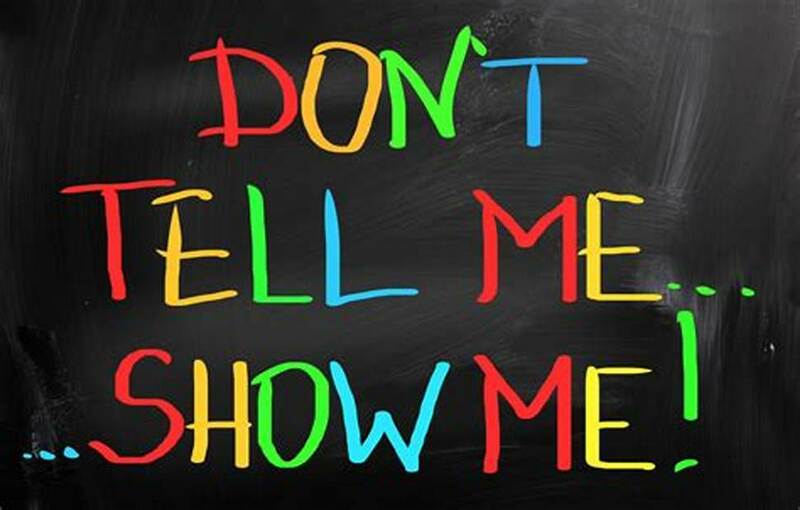 I’ve been thinking more about show don’t tell, and how to teach it to you, and I’ve realised that different writers use show don’t tell in different ways. This is again, why it’s important for you to read more things, if you hope to learn about this. Yesterday I was getting advice for how I can get better at introducing stories, because I’m not very good at it, so I had to improve the beginning I already had. I was told I could use show don’t tell in the description, by using the effect to describe the cause (don’t mention the cause). I never knew that, because it’s not something I do. What I usually do, is use show don’t tell, to let a negative prove a positive. I need to read more books, as I don’t read. Reading my answer again, I realise how explanatory yet ambiguous it is. I will now expand, to clarify my above points to all you lot who never understood. I’ll take it that you already know what show don’t tell is right now. Explaining something through narrative context or a character’s actions, without making it blatantly obvious. It is implicit. The opposite is explicit. Realising that my meaning will be lost, without clear examples, I’ll now give you some. The examples will be taken from actual literature instead of a basic one I’ve just made up. I don’t like it when people comment on my answers saying they don’t understand, so I’m going to make sure you all do with lots of explanatory text. Here is an entire chapter I’ve wrote that consists entirely of narration. The chapter seems rather simple, but there is a lot technically, going on in it. The situation here is that a deadbeat father has visited a family household, and everyone except Sheridon who is the oldest child, wants him gone out the house. Stefan is a young child who doesn’t know any better to have an opinion. Stefan was on the kitchen with a catalogue for toys, and he was using scissors to cut out the toys he wanted, so he could glue them onto coloured card. He was making art. Debra was sat on the table with her organiser and a pen, and she was going backwards and forwards through the organiser writing things, crossing things out, and circling dates. Sheridon was having a conversation talking about things, and getting more involved in the conversation as time went on. The words spoken on the other end were like tapeworms entering his ears and into his brain. Terry was sat on a table listening to every word of the conversation, and was getting involved, and some might think, that nobody minded her getting involved. Debra’s hatred for her ex was growing with each word that he spoke. When he spoke it sounded to her like a preacher who discouraged people from being interested in other religions. I like to use a negative to imply a positive, have the absence of something to prove the presence of something. And in this case, I’m using the disengaged family members’ stress-distracting solitary procrastinating actions, to describe how much hatred there is for the father. There is no narration saying that there is hatred, that’s just what the chapter title says. The reason why I have stated the obvious to say Sheridon was talking about things (you don’t say! ), is because as he is the only happy person and participant around, the contrast of using a positive to plainly state an obvious positive the reader already knows about, would further get across Sheridon’s feelings to the reader, without any explanation of them. And yes, someone did mind Terry getting involved, the Dad minded. That’s show don’t tell done again. The phrase “and some might think” is a subtle of way of me saying “on the contrary to how things looked”. What is always a good thing to do when writing is what is called characterisation. It means when you describe a character to the reader by their actions and attitude, rather than through narration or description. If you can’t identify it in writing, read OCR Opening Worlds. It’s an anthology used in British schools for English GCSEs. He stuck the needle inside me, and it hurt. I screamed out in pain and didn’t know what to do when I stopped. Not only that, I could feel something in my skin. I was terrified. I was scared. And I felt betrayed by the girl I thought was my friend. I got up, and looked at the girl and boy, and they both had the same look on their face. They didn’t care. Never before in this world, have I been stripped of my human rights. No matter what I do, I’ll never be the same as them. “Goodbye now” said the girl. I thought for a moment. “What does f*** dat s*** mean?” asked the girl. “You’d rather not know.” I replied. The boy didn’t know either. “You tell me to go, now I’m staying. How’d ya like that one?” They both did not respond, because they did not care. Now I tried to walk in the house. “Aaah that friggin hurts” I gasped as I tried to walk in the house. “That’s a side effect from the injection” explained the girl. “It’ll wear off”, she said trivialising it. “Try not to move your arms” said the boy. I did not like the way he said it. I walked towards the house showing him me not moving my arms. Up to this point, I had only taken three steps. “Oh can you prepare the bed adjusted?” asked the girl, looking at him. “Yes I can, right away.” He ran into the house and beyond. “What do you mean prepare the bed adjusted?” I asked the girl, making the boy stop. “What did you think it meant?” asked the boy. Clever use of sarcasm from the girl, and being patronised by the boy. Nice! I have only told the main character’s feelings, naturally in this 1st person story. I have not once explicitly said that the characters are mysterious and devious. That was solely done by attributing them with mysterious and devious actions. I characterised them, so you would think them of that way. The sentence “I did not like the way he said it” is highly responsible for this. These characters have unique personalities, but they are not explicitly pronounced (with adjectives). Show don’t tell! So you think that both characters are twisted and bad, right? Think again. The girl is characterised as whimsical and innocent, and the boy is characterised as protective and old fashioned. “Would drink quench you nicely?” asked the girl. “You wouldn’t know what I am” I replied. “You wouldn’t know what I am” he replied. “Never you mind” he replied. Only one character in the book is dark, cold and dismissive. That’s the power of characterisation for you. Another thing I like to do is use a spontaneous unexplained change in a character’s attitude in conversation to express how they feel to the reader, to get them emotionally involved into the story and have them become empathetic towards the characters in the story. An example of me doing this is here. Later on in the book. She walked down the stairs, not fast, but not slowly either. “Yes, I’m back I hope you didn’t miss me.” He gave me a dirty look that meant she didn’t miss me. I know what they all think. They think I’m just here for the secret garden. They’re all right. I shouldn’t be here. “Do you want some tea?” the boy nicely asked me. I take it they’re both being falsely nice to me. “Yes, three sugars please.” I don’t usually say please, but I didn’t want to upset anyone. He looked at her, and she said she wanted the same as me. It was only like yesterday, when I was making tea for them. Now they’re being nice to me without wanting to know me. Since when did I explain how the girl feels? I showed her actions, but never attempted to tell her feelings. Let’s compare that to the first chapter of the book. “Hello, you must be a visitor, nice to meet you. How do you do?” She walked from her back door to a speaking distance near me before she said that. She did a curtsey as well. Now he’s an example of the same thing, but done instantly and not throughout time/chapters. Keep in mind that different authors use show don’t tell in different ways. There is no one definite way to write stories. I can only speak for me. I can’t speak for anyone else and what other authors do to make their writing emotional and immersive. Using a spontaneous unexplained change in a character’s attitude. Showing the effects on something but not specifying the causes. I hope that the examples I’ve used have got you learning something new today. This is why it’s extremely important for you to read new books, to see writing techniques in action. If you don’t read other books, how else would you know what’s possible?